Oral-B Kids Electric Toothbrush Just $14.99! Down From $32! Shipped! You are here: Home / Great Deals / Amazon Deals / Oral-B Kids Electric Toothbrush Just $14.99! Down From $32! Shipped! 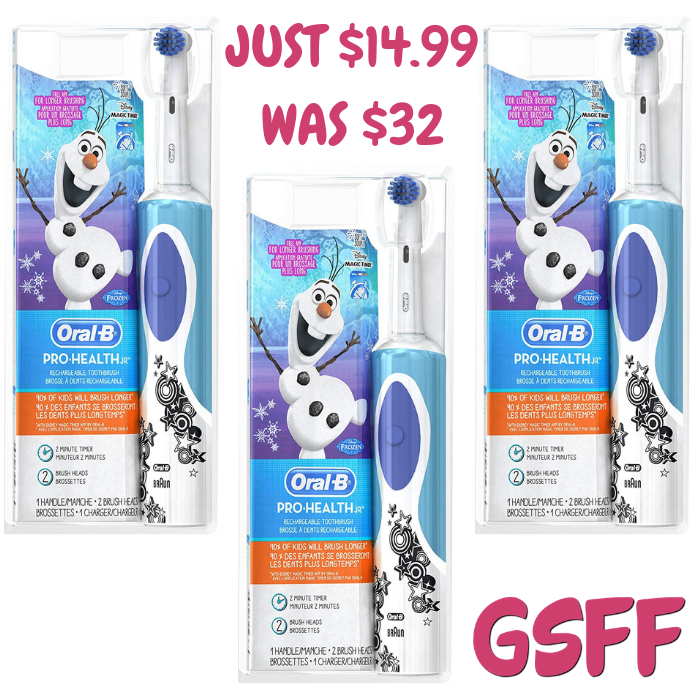 Amazon has this Oral-B Kids Electric Toothbrush With 2 Brush Heads on sale for just $14.99 down from $32 when you clip the extra $5 coupon located below the price! PLUS, it’s FREE shipping! This Oral-B Pro-Health Jr. rechargeable toothbrush is the perfect kids toothbrush for a healthy, thorough clean. While their smiles continue to grow and develop, there’s no better time to start healthy oral care habits. This electric toothbrush has a waterproof handle to be used with Oral-B Pro-Health Jr. Sensitive Clean toothbrush heads that provide a gentle brushing experience. Use with the Disney Magic Timer App by Oral-B that revolutionizes the way children brush for a dentist-recommended 2 minutes.